Apart from theme, style and color scheme, lighting is among one of the most the important aspects in creating ambience and setting the preferred mood in your home. Actually, it is the tiny details that end up creating a bigger difference when it comes to your home decor. A slight alteration in lighting can result in a major change of your room’s vibe. Of course, you do not want to create a dull and boring space. All you might need is a lovely table lamp fixture that helps create an exciting and cheerful hub. When it comes to making your home more personalized and stylish, illumination plays a major role. 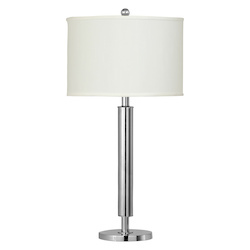 Just like any other lighting fixture, table lamps provide great illumination, which can provide general or precise lighting. 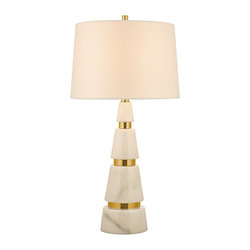 Table lamps are an important requirement for any room. They do not only serve the vital role of providing functional illumination and mood lighting, but also enable you to build the style profile of your room. This allows you to show off your personal tastes to your family and friends when they pay a visit to your home. 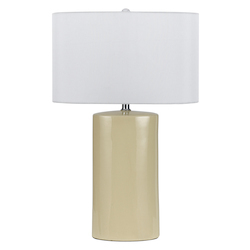 Due to their portability, table lamps are a special form of lighting. They allow you to rearrange the furniture in your room more easily. Unlike ceiling fixtures, they do not require any installation; you can always carry them with you whenever you are moving to a new home. 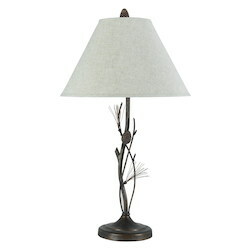 Table lamps are more flexible when it comes to placement and can be positioned anywhere in the room. They also provide excellent ambient lighting. The light produced by table lamps is easily illuminated to semi-reflected off of surfaces, including the ceiling. 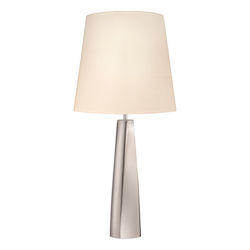 Full spectrum, contemporary table lamps provide whiter light compared to traditional lamps. They produce excellent reading lights, especially when seated in a chair. It is very important to take your time before making a choice on your preferred lamp. 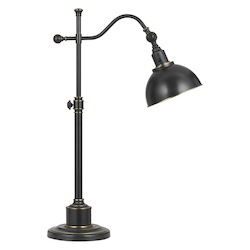 This will enable you determine the size and brightness of your lamp. 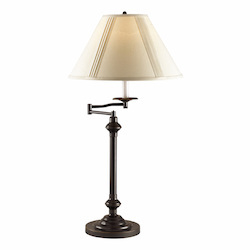 With the various table lamps available today, making the right choice may be hard. Choosing the right table lamp does not only enhance your room decor but also improves the functionality of the available space. 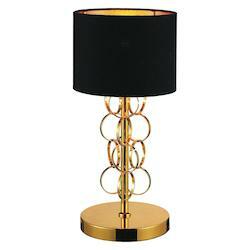 The following is a guide on how to choose the perfect table lamp for your room. 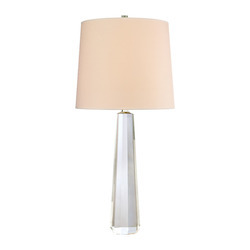 Before shopping for any table lamp, you need to clearly define its intended purpose. This involves identifying whatever you need the light for: whether for dining, accent lighting or reading. 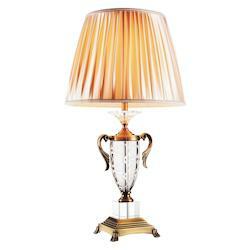 Most table lamps are usually purchased more for decorative purpose than function. This is because they usually look elegant on an end table and add that extra design that would not be present in your room. 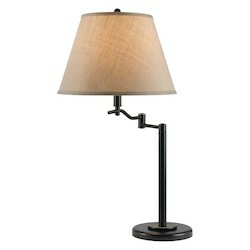 A reading table lamp should be quite tall on an end table for easy reading next on a couch or an armchair. They also provide the sufficient light required for hobbies such as playing games or cards. For bedrooms, 20-inch to 26-inch lamps are more comfortable on nightstands placed next to the bed for reading. You need to be careful about the table lamp’s location to avoid shadows being generated by your head whenever you are reading. If you intend to use the lamp for reading, do not place it behind a chair. 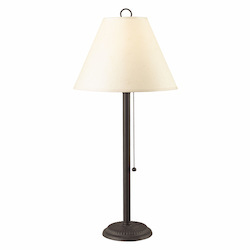 These are types of lamps that are usually used in dining rooms for buffet style eating. Their configuration is quite taller and narrower in proportion to their shades, which are usually narrower than 11 inches. Buffet lamps need to be placed in a way that light is illuminated everywhere in the house. In order to achieve this, you can position the supporting furniture against a wall. 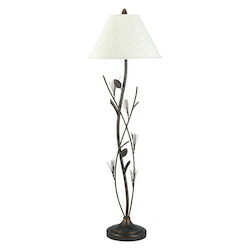 Accent table lamps are used to bring light to the dark corners of a room. However, they are not bright enough for performing tasks such as reading. They are made as interior design elements and can make your room lively, especially at night. The style of your room is the second thing you should consider when identifying the lamp style that best suits your space. 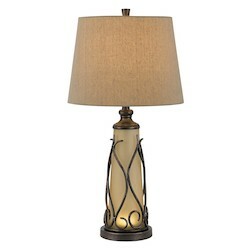 Normally, modern lamps feature nickel or bronze finishes while traditional lamps adopt brown or gold finishes. 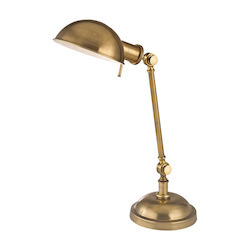 For colonial table lamps, brass and gold are usually the common finishes. You also need to think about whether the lamp design you choose detracts your expected level of brightness. For example, if you are looking for something that compromises between aesthetic and functionality, you may choose either a design with a glass shade or one with shadeless lamp. For living rooms, you need a lamp with at least 100-watt bulb to allow for adequate spreading out of light into the whole room. This will enable you and your family members to see clearly whenever you are walking through the living room. At times, you may need a three-way bulb to lower light at certain moments. 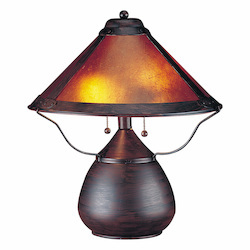 Lamp styles are usually defined by lampshades, lamp bases and lamp finishes. Lampshades provide a perfect way of spicing up your existing home decor. They can be used for altering the type of light produced by a table lamp. 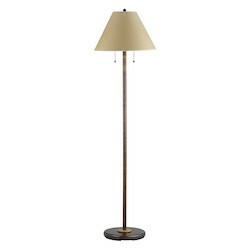 Typically, it is the shade that determines the kind of light produced by the lamp. This means that lamps of similar styling can serve different functions with slightly different shades. You can use a patterned lampshade to update a tired table lamp, hence adding vibrancy to your room. For those who prefer more light, you may prefer a translucent lampshade with a soft color that allows more light to pass through. Tiffany-style lampshades are a classic option for glass lampshades. 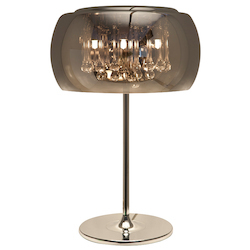 Lamp bases are available in glass or ceramic designs and come in wide ranges of wood and metal finishes. 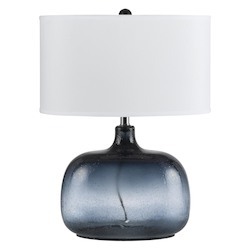 You can choose from a cobalt blue ceramic base, satin nickel metal base or clear seeded glass base. 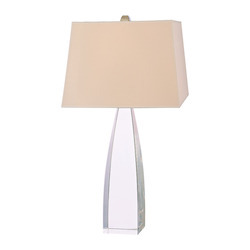 There are a variety of table lamp finishes that buyers can choose from. Some of the most popular finishes are antique bronze, oil-rubbed bronze, brushed nickel and satin nickel. When choosing your color finishes, always take a cue from your existing home finishes. 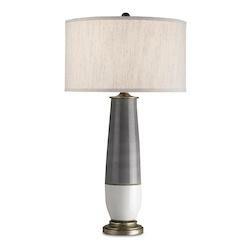 For example, if your cabinet hardware and door handles adopt brushed nickel, then you need to choose a table lamp with a finishing that compliments the current decor. 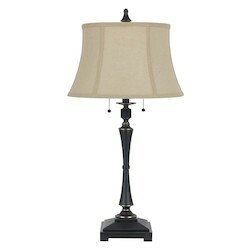 The next step in choosing the right choice of table lamp is determining the place where you want your table lamp to sit. 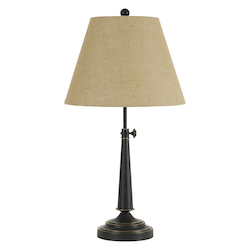 You need to size things up in order to identify the perfect location to sit your table lamp. This also involves chalking out the exact height where the lamp will be placed and its distance from your couch, bed or cozy chair. 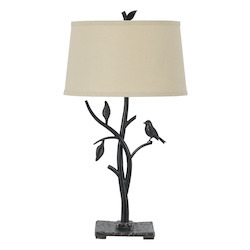 The height of your table lamp should be determined by the room decor. 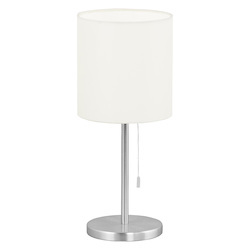 Short table lamps are perfect for tall bedside tables, while tall table lamps are perfect for short bedside tables. 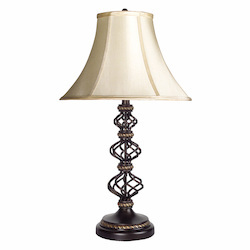 When picking a lamp, ensure that the bottom of the shade is at your eye level when resting or seated. 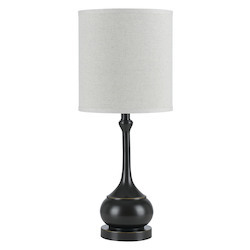 This works for reading table lamps, bedside lamps, night table lamps and the similar. Always avoid lamps that have shades that extend over the table’s edge. 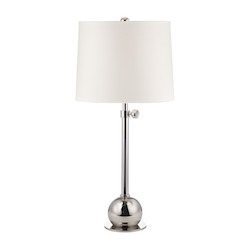 Starting off by buying a table lamp before identifying its exact position is not a smart idea because the lamp may end up being too short or too tall for your room size. You may also fail to achieve the right amount of desired lighting. 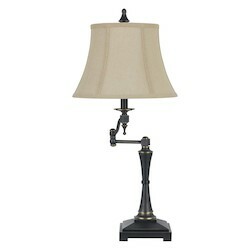 Traditional table lamps enable you to maintain the formal tone of your bedroom or living room. They are available in various designs such as those with the glow of a simple silk shade or those featuring ornately carved wood. 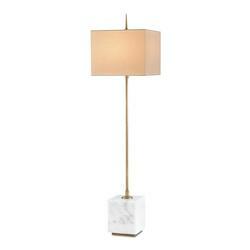 You can also create a romantic ambience with traditional table lamps with a marble base. Alternatively, you can opt for those with bases of copper, brass and bronze to create a timeless elegance. Modern table lamps create a sleek contemporary decor and are available in various forms. Some of them feature bold color patterns, clean sharp lines, chrome accents and geometric shapes. These lamps are made from different materials, such as plastic, glass and wood, and create a lighting source which doubles as artwork. They are available with unique details that make them stand out in your space. 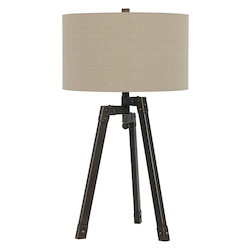 These details include offset stacked bases, tripod legs and oversized shades. 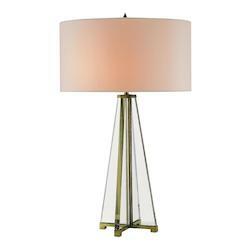 Glass table lams are a generally versatile lighting option for enhancing your room decor. They are used to compliment traditional and modern lighting systems. 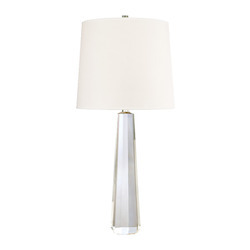 Glass table lamps with chrome accents and geometric shapes are used for decorating modern rooms. For traditional styling, you can opt for glass table lamps with a solid base, spheres and fluted columns. 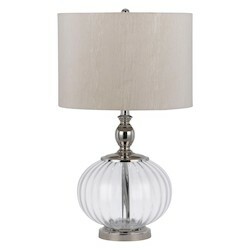 Clear glass lamps are prefect for darker or smaller spaces while colored glass lamps are perfect for accent lighting. 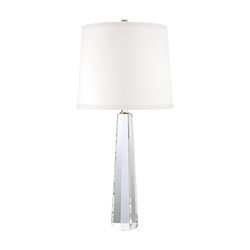 Crystal table lamps are delicate and sophisticated in design. They provide an effective way of adding elegance and sparkle to your room. 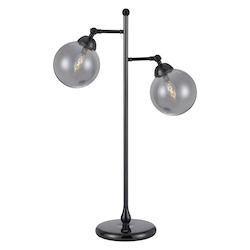 Some of these table lamps come with pieces of suspended drop crystals while others feature stacked crystal globes. They have the ability of refracting and dispersing light. Which make them a dramatic, bright light source. They are perfect for formal entrances, living rooms and dining rooms. 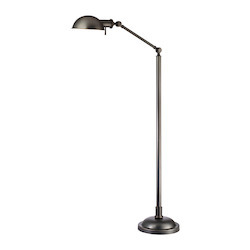 A desk lamp fits the bill if you want a direct source of light for an office workspace or study room. They are typically designed to sit on top of the desk or are clamped onto the desk. These lamps come with a high level of flexibility since they are adjustable, allowing you to aim the light at a precise point where you require it. 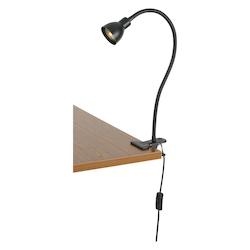 Some have flexible gooseneck stands, which can be bent and twisted as desired while others have stands with multiple joints which are great for allowing you to reposition the light. Tiffany lamps are another classic and great way of complimenting a contemporary or traditional design theme. 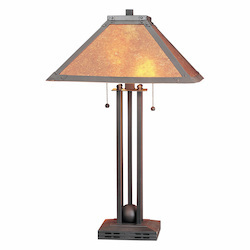 Typically, they feature a bronze colored base and stained glass shade. The come in different design patters such as dragonfly Tiffany lamps, mission-style Tiffany lamps, floral Tiffany lamps and peacock Tiffany lamps. When they are lit, they produce a colorful pattern with a unique focal point. Himalayan salt lamps have a distinctive unfinished look and feature a soft orange glow. They are very unique forms of table lamps for accent lighting. They are made from rocks that are mined from the Himalayan mountain range and which is where they get their name. These are fun additions to retro-inspired decor. 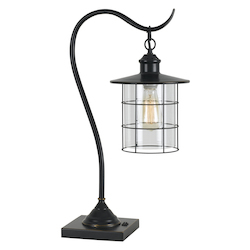 They are mostly used for decorative lighting rather than general lighting, therefore are best suited for teens bedrooms. This is because they emit a soft, dim glow. The lights work by heating wax blobs that rise and fall, changing shape as they move. The wax is enclosed in a glass vessel full of translucent liquid. The lamp base should be dusted regularly. When replacing lamp bulbs, always check on the recommended settings to avoid exceeding the wattage. Always ensure that switches and cords are intact and are functioning normally. Lampshades should be vacuumed regularly to remove dust. Glass lamps should be wiped gently with a glass cleaner and soft cloth. For Himalayan salt lamps, wipe them down with a damp cloth to remove crystallization and dust. Lava lamps should be allowed to cool down completely before wiping them with a damp cloth. 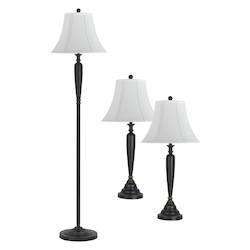 Table lamps offer you an opportunity to purchase the specific type of lighting you want. Choosing the ultimate lamp design is an exciting experience and there will be always several lamps that match your desired needs. 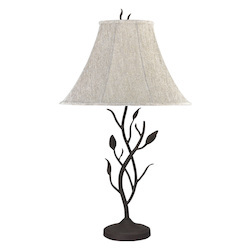 At We Got Lites, we have table lamps for every occasion and that fit into every scenario. 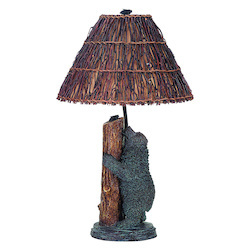 Whether you are looking for rustic lamps for log cabins or colonial brass lamps for libraries. We have taken into account putting together a fantastic range of table lamps that will compliment your room or home design. Our wide range of table lamps appeal to a variety of tastes and you will have no trouble finding the best piece that will excite you. We understand that you care about the design and function of your room and that is why we offer our customers many different options of lighting to choose from. 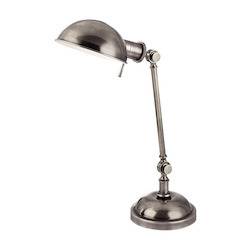 You can find out more about our elegant range of table lamps by getting in touch with us. 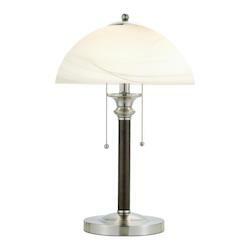 Call us today for great discount on our cheap table lamps.